Institución Educativa Cecilia de Lleras was established in Monteria (Córdoba Department) by Ordinance No. 21 of 25 May 1969. The flag of the institute is described as diagonally divided indigo blue-white-green. The upper, blue part and the lower, green part each form a right-angled triangle. Blue is a symbol of the sky covering the Sinú valley, supplying life and elation. White is a symbol of frankness, determination and human feeling. Green is a symbol of the fertility of the fields and of the vivacity of the youth. However, the companion drawing shows the flag with horizontal stripes. A photo seems to confirm the horizontal arrangement of the stripes. "Colegio CEDID San Pablo" was founded in 1988 in Bosa, Bogotá. The flag of the institute, as shown graphically on the website of the institute, is horizontally divided yellow-light blue-white. CEIPA is the 'Centro de Investigacion y Planeamiento Administrativo'. It was founded in Medellin in 1972 by Antonio Mazo Mejia and his wife. In 1992, the CEIPA was granted the status of University Foundation. The flag of CEIPA is yellow, for excellence, with two thin white stripes, for transparency required for excellence in business, in the upper and lower parts of the flag, and the shield of the institute in the middle. The shield of CEIPA is U-shaped, for University. The symbol placed on the shield was used in the Middle Ages by merchants. The four arrows symbolize the four compass directions, in which commerce should spread, whereas the moon crescents and stars are symbols of business. This medieval symbol was selected to recall that both business and university concepts date back to the Middle Ages. Source: virtual.ceipa.edu.co>, located by Dov Gutterman. "Liceo 'Celedón'" was founded in Santa Marta, Department of Magdalena, on 24 November 1905 (Decree No. 118). Named after Rafael Celedón (1833-1902)), appointed Bishop of Santa Marta in 1891, the institute was declared "National Monument" on 17 December 1993 (National Decree No. 2529). The flag of the institute, as described on the website of the institute, is made of the two colours white and green. The arrangement of the stripe is not detailed. The emblem of the institute designed by Diomedez Varas shows on the shield's right a flag horizontally divided green-white-green, presented as "a flag, green and white symbolizing peace and hope". White represents purity of heart and mind. Green represents hope, strength and energy dedicated to study. Institución Educativa Celmira Huertas was established in 1980 in Ibagué (Tolima Department), as Escuela Séptima Etapa. The school was subsequently named for Celmira Huertas, a teacher whose seven children became teachers, too. The flag of the institute is horizontally divided orange-white-green. Escuela Leovigildo Gutiérrez was established in 1992 in the La Rosita borough, part of the municipality of Villavicencio (Meta Department). Colegio Centauros was established on 17 September 2002, merging Escuela Leovigildo Gutiérrez with three other schools, located in La Cecilia (est. 1984), Juan Pablo II (est. 1992) and Amor (est. 1990) boroughs, respectively. The flag of the institute is horizontally divided green-red with a blue four-pointed star in the middle. 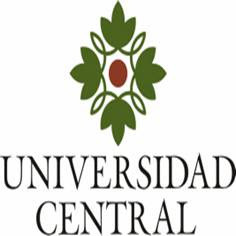 The Universidad Central flag has two versions: one is a white horizontal flag with the logo (without inscription), and the second version is the same horizontal white background with the logo in the middle plus the University's name below in black capital letters. 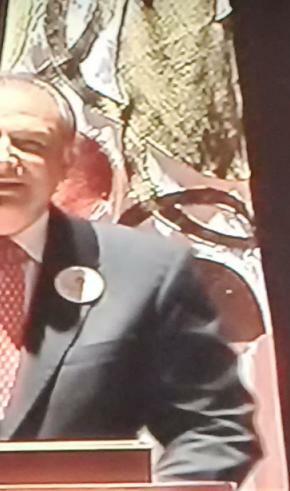 I'm attaching a sample of this flag (the first version one, plain logo without inscription), during a speech by a government official at the Universidad Central aired on August 5, 2015 but held the day before, August 4. Also, the University's flag is seen in this article (flag on the left) about a reputed piano player giving a concert on October 19, 2015 (article published on November 6). In the video, the flag is also seen. Institución Educativa Centro de Comercio de Piedecuesta (Santander Department) was established by Resolution No. 12,506, issued on 28 October 2001, as the merger of Centro Femenino de Comercio, Concentración Escolar Nuestra Señora de la Presentación, and Jardín Infantil Nacional de Piedecuesta. Centro Femenino de Comercio was established, as the girl's section of Colegio Balbino García, by Order No. 7, issued on 25 November 1948, to be renamed to Escola Normal Rural in 1953 and Colegio Oficial de Señoritas in 1964. The name of Centro Femenino de Comercio was established by Resolution No. 6,648, issued on 28 November 1974. Blue is connected with intelligence and conscience, and associated with stability: thinking depth, loyalty, confidence, knowledge, faith, truth and the eternal sky. Blue has a tranquilizing effect on mind and also represents peace, balance and harmony. White is associated with light, kindness, innocence and purity. White is a symbol of perfection, safety, purity and limpidity; considered as the color of perfection, it generally has a positive connotation. In heraldry, white represents faith and purity. For these reasons, the blue and white colors of the flag of Centre de Comercio represent knowledge and wisdom, truth, rectitude, values which are clearly involved on the development of intelligence and the conscience of our educational community. Basically, the chromatic elements that compose the coat of arms of Centro de Comercio are white, yellow and green. - the wreath, elaborated with plant components, recalling the crown awarded to champions in the Olympic Games of ancient Greece, as a symbol of triumph, success and achievement. Dr. Jesús Casas Manrique founded "Liceo Infantil" in 1934 in Bogotá. The institute was renamed in 1937 "Liceo de Cervantes", as a tribute to the founder's father, Dr. José Joaquín Casas, who was found of the Spanish culture and, especially, of the writer Cervantes. The modern grounds of the institute were built in 1944; in 1949, the founder of the institute transferred it to Augustinian fathers, only requiring that the name of the institute would not be changed. The flag of the institute, as graphically shown and described on the website of the institute, is quartered yellow-red, the colours of Spain and Bogotá. It appears that the previously reported flag is wrong. The flag of the College is square, horizontally divided yellow-red-yellow, with the emblem of the college in the middle. Source: www.voluntad.com.co> (defunct), located by Dov Gutterman. "Universidad CES", founded on 5 July 1977 in Medellín, was recognized as an university by the Ministry of National Education on 22 March 2007 (Decree No. 1371). CES offers programs in Biology, Law, Physiotherapy, Biomedical Engineering, Medicine, Odontology, Psychology, Veterinary and Zootechny. The flag of CES, as described on the CES website, is horizontally divided white-dark blue. Blue represents tranquility, confidence, harmony and the sense of responsibility. White represents integrity, strength, purity and vigilance. The arrangement of the colours is not given. Colegio Cesar Conto, founded in August 1965 in Cali, caters today 1,400 students. The institute is named after the poet and Liberal politician César Conto (1836-1891), President of the Sovereign State of the Valle del Cauca in 1875-1877. The flag of the institute is presented on the institute's website as horizontally divided blue-white. Blue represents justice, perseverance, vigilance and the sky. White represents, purity, commitment and truth. "Instituto Tecnológico del Cesar" (ITUC) was recognized by the Assembly of the Department of Cesar in 1973 (Decree No. 050) and inaugurated on 15 May 1973. ITUC was transformed into "Universidad Popular del Cesar" by the Ministry of National Education on 25 June 1993 (Decree No. 3272). 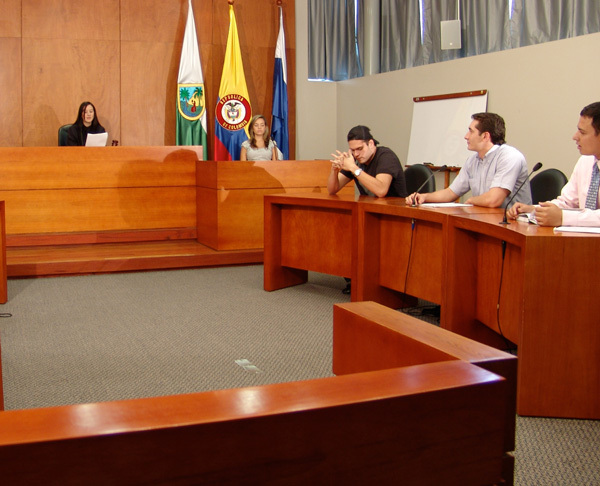 The main seat of the university is located at Valledupar; there is a secondary seat in Aguachica and presence in the municipalities of Chimichagua, Tamalameque and Maicao. The flag of the university, as shown graphically and described on the University's website , is vertically divided green-white (c. 2:1) with a green stripe in the upper corner and the emblem of the university in the middle of the white stripe. The emblem of the university was designed by Jairo Obregón Salazar, student in Law. It is made of a diamond, black in its upper part and blue with a yellow sun in its lower part, placed on a red device, surrounded by two laurel branches. The name of the university is written in black letters above the emblem, while its motto, "Educación y Futuro" ("Education and Future"), is written in black letters under the emblem. The diamond represents the university, permanently irradiating light on the vast field of knowledge. Blue represents the transparency of the sky and the revealed truth, while black represents darkness and ignorance. The sun recalls Prometheus stealing a sun ray to show the truth to mankind. Laurel has always been associated to culture and was also used to crown the Greek heroes and Roman emperors.